Register an account with LocalBitcoins. You get a free and secure online bitcoin wallet. No additional apps are needed. 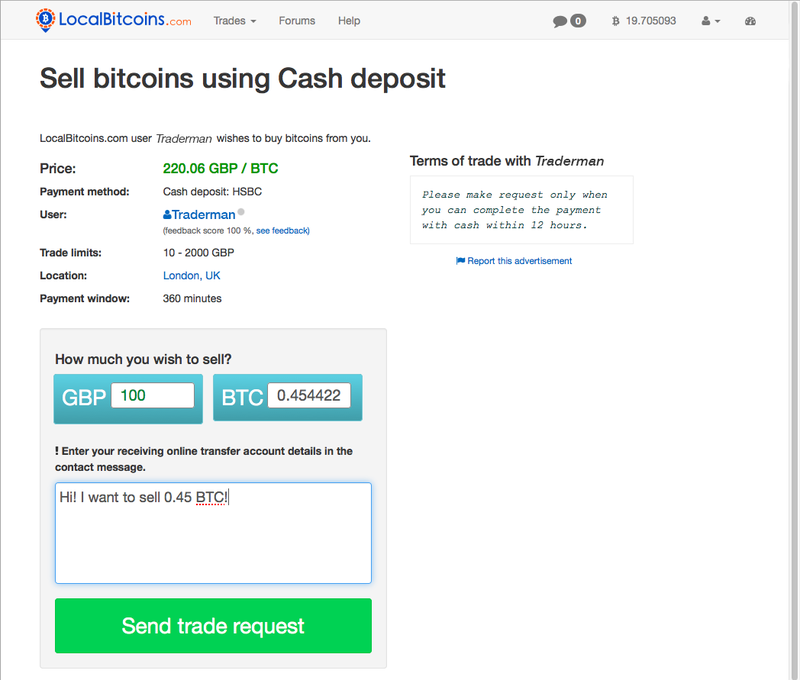 To sell Bitcoin you need to first send them to your LocalBitcoins wallet. If you need help with this, please see the tutorial video below. Go to the main page and in the search box select the option QUICK SELL. Fill in the form with the amount you want to sell in your currency and choose a payment method. If you're unsure how you want to be paid, choose All online offers as your payment method. The site will then list all Bitcoin offers available. Note about payment methods: Some payment methods are considered high risk. Bitcoin transactions are completely irreversible. Once you sell your Bitcoins it's not possible for you to recover them, even if the buyers payment is reversed. That's why we recommend you sell with a low risk payment method to experienced users with a large amount of previous trades and 100% feedback. Read more about payment method risk levels. From the list of offers, choose one where the trader has a good reputation score and a high amount of completed trades. The response time indicator shows if a trader replies within five minutes (green), within 30 minutes (yellow) or slower than 30 minutes (grey). You can click the sell button to view more information about an offer. After you press the Sell button you'll see more information about the offer, including the terms of the trade. Read through them before submitting the trade request and if you don't agree with them you can go back to the previous page and choose another offer. To start the trade, type in the blue box how much you want to sell, enter a message for the buyer and click the Send trade request button to the start the trade. Once you start the trade your Bitcoins will be moved from your wallet to the trade escrow. After you've sent the trade request the buyer will ask you for your payment details (e.g. if you want to sell for a bank transfer the buyer will ask for your bank account information). After you have given the seller the payment information the buyer will pay for the Bitcoins and confirm it to you. Please make sure that you have received the money into your account before releasing the bitcoins. NEVER release Bitcoins before you have received payment. Bitcoin transactions are irreversible, once you send the Bitcoins to the buyer there no way to get them back, even if the buyers payment doesn't show up. Once you have confirmed that the payment has been made you can scroll down the page and select Release Bitcoins. This will send the Bitcoins from the trade escrow to the buyer and complete the trade.